after not twitching a single crafty muscle for about a month, yesterday i came surging back like an unstoppable rebel force. i was inspired by my buddy, merran (she of the ridiculously perfect first birthday party), who made some super cool stuff for her son luke. so of course i stalked her referenced blogs and got a whole boatload of ideas. the first project i did was actually something totally random that i had found via stumbleupon last week, but once i had the creativity keg tapped again, all sorts of stuff was flowing out. plus i had to wait until i got home to do merran's project since it required an iron, but this little gem i could do at...um, well, exactly where i was. i found a tutorial for these on the not martha (you can guess which martha she's not) blog. side-view of my lil love-mushrooms. 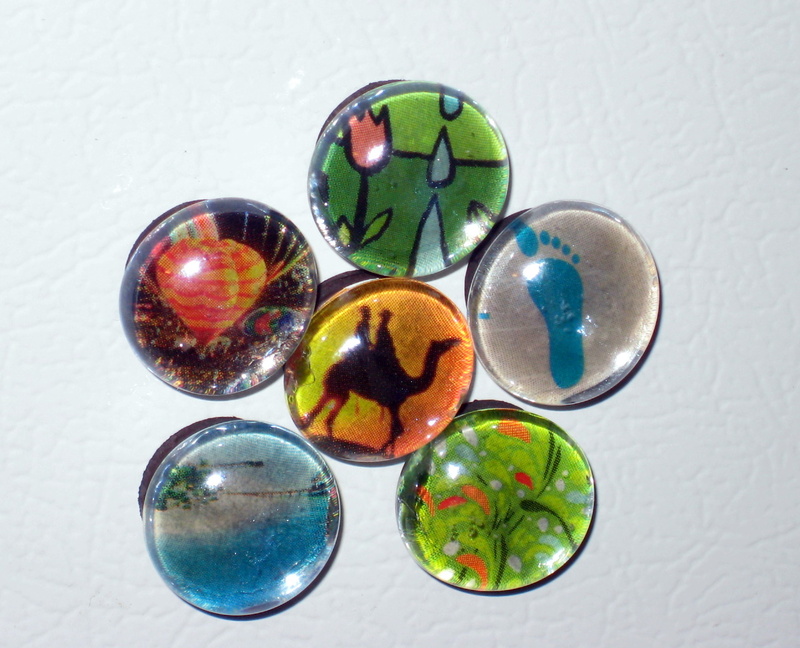 these are adorable, 100% customizable, highly giftable little marble magnets. 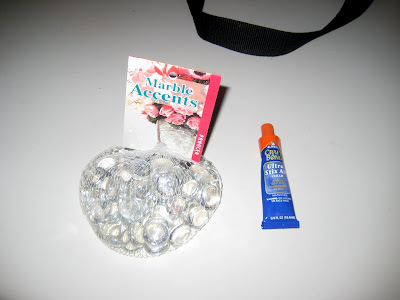 after a quick and cheap trip to joann i was ready to make 20 of these for $8 (and i have plenty of leftover glue and marbles to make tons more and would only need to restock the magnets). these were so so so easy to make. the biggest of craft-tards could pull these off with ease. the most time consuming part was finding little and cool enough pictures in all my magazines and that was totally fun. once you have them cut out (i used an x-acto knife and just traced around a magnet. doesn't have to be a perfect circle, the marble's magnifying effect is very forgiving), each one takes maybe 10 seconds to assemble. i made my 12 magnets in about 30 minutes, even with browsing the mags. camel at sunset, hot air balloon, watering the tulip, foot, grassy field, tiny beach. love them! i went with pretty pictures but you could so easily make an entire set of the alphabet in all sorts of cool fonts or numbers, or someone's names (for a lil gift). they are the perfect size for a choking hazard so these live towards the top of the refrigerator until judah stops eating everything like a baby goat. 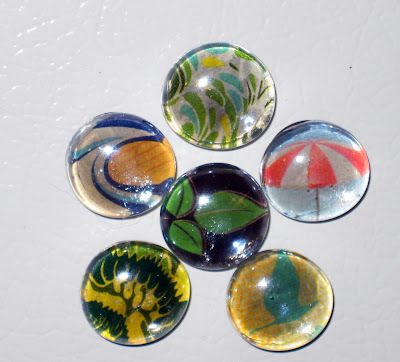 i really liked not martha's idea of putting a set of these in a little altoids tin (metal, get it?) and giving them as gifts. i mean they aren't going to make anyone faint with rapture upon receiving them, but they are cute, handmade and one of a kind. so when i got home i was in heaven. i made poppyseed chicken for dinner (a binge-favorite) and jesse took judah to a youth event thing so i had the house and the meal all to myself. i got started on the project i ripped off from merran, who found an awesome tutorial on i am mama, hear me roar. i have done stenciling before, but never with freezer paper and always with a piece of cardstock i had to hold or tape in place. whoa baby. so much easier. i got a 75 foot roll of this amazing stuff at publix for $3. i found a bitching webdings-esque font here that is chock full of tiny graphics that make perfect stencil patterns. i just blew up the image i wanted and put my freezer paper on my laptop screen and traced the outline (you could print it out at whatever size you needed too if you respect your computer screen more than i do). 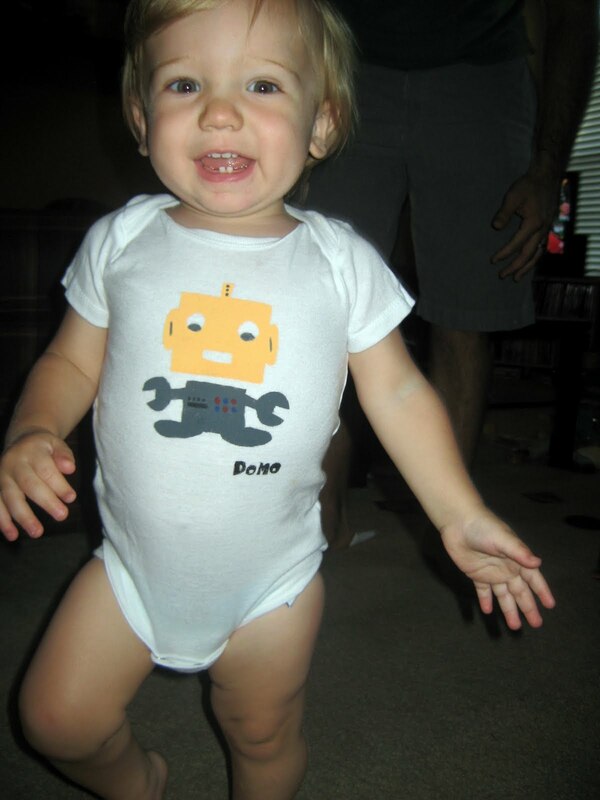 lowercase x in this font happened to be a really cool little robot, so i went with that. there are about 14 other of these graphics i can't wait to use also. 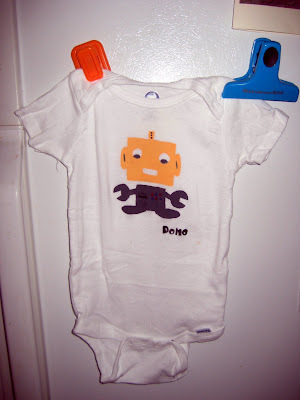 the robot stencil was blank when i first painted it on, but i wanted him to have more personality, so i added the buttons and facial features by hand and then put the little "domo" signature there cause i'm cheeky like that. it was incredibly fulfilling to make all of these crafty wares, plus last night's dinner (which is today's lunch) and get tonight's dinner prepped and marinating while the chicken cooked all in the same amount of time that i usually just would have spent watching the office reruns. yeah the supplies for these projects cost money and i probably couldn't have done it without jesse being on judah duty (though he will sit in the kitchen an fixate on me whenever i am cooking rather than running amok), but i would probably feel tons more productive and better about myself if i could pull off just one night like this per week. 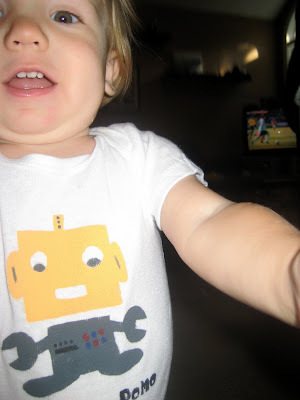 judah, show me your impression of a killer robot, come to dominate humanity with your robo-double chin. hey, nice job. I LOVE the magnet idea!! I'm definitely going to try it out! LOVE! the robot is awesome. can't wait to check out that webding-esque font. i especially love your robot's eyes. cute! the magnets look great. i love making those. soooo fun and easy. wrapping paper/scrapbook paper also works great if you have some that you really like. keep it comin' and i'll do the same so we can keep getting our craft on. love me some crafts!!! So glad that you are back at the creative stuff! I'm sooooo impressed and may even be inspired to do something crafty myself. I still have no idea what freeze paper is though. I'll have to look at some of the blog links to see if they can explain it for dummies like me.